Accommodations for animal movement: A livestock scale that has an average weight hold feature will give the most accurate measurements by compensating for the uneven weight distribution inherent in these applications. The design and engineering of the scale ensures that you can weigh livestock more effectively. Weight capacity: Depending on your specific use, you may need a scale that can handle cattle or one to weigh smaller animals. Be sure to check the weight capacity to be sure you’re matching up with the right product. Heavy duty construction: Livestock scales must be ready to take the abuse that may be incurred in these applications. They must also be watertight to handle all kinds of environmental factors that can often come into play. The components should have a galvanized finish to reduce rusting and an aluminum alleyway will help extend the life of your scale. Accessories: Most of the livestock scales we offer come with everything you need to set it up and use it as soon as possible. You may also want to consider purchasing a printer and an indicator stand to make weighing applications even easier and more streamlined. You can also find ramps and other add-ons that also help with your specific needs. Features are of paramount importance, but price is always a factor for large purchases. Business owners must know that they are getting a good deal on a quality item that will meet their needs, and hopefully save money or help them do more in the long run. We understand that a livestock scale is an investment. We encourage every potential customer to review the options we have here and contact us with any questions or concerns. 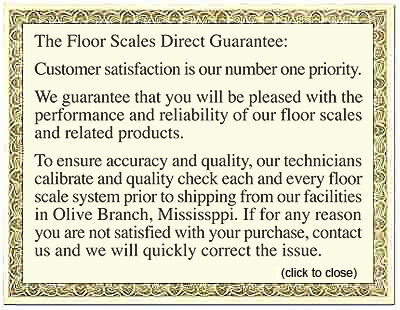 We are committed to helping you get precisely the right weighing tool that helps your business.